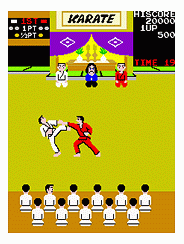 One day I was sitting at home and I got the strangest urge to play that classic game "Karate Champ". So, while browsing the web, I found this software that would play the game on my PC. The software was called MAME. However, I didn't realize exactly what MAME could do until a couple of days later. It finally hit me that MAME was capable of playing thousands of classic and newer arcade games on my PC! I was very impressed, and excited. Looking through the list of supported games, I saw many games that I loved playing growing up. While continuing to browse the web for more information about MAME, I found James' Mame Machine site. I thought to myself, "People are building full size cabinets with controls and everything to play these games...this is gotta be one of the coolest things ever!". I've always wanted an arcade machine growing up, and I promised myself I would get one when I bought a house. But, what is better than one machine that can play thousands of games? You can't beat it! At this moment I knew that I had to build a MAME cabinet! October 29, 2004 - I've made some updates to the cabinet since the last time I made a post. First off, my wife bought me a couple of Act-Labs USB TV light guns last Christmas. The guns work great, and MAME has built in support to use two guns in tandem. I installed a couple of coat/hat hanger hooks from Home Depot on the sides of the cabinet to hang the guns. Second, I made some hardware changes to the PC. I swapped out the motherboard, which was a P.O.S, with another one that I had. The old motherboard caused every Windows installation except Windows 98 to blue screen during the install. I also swapped out the CD-ROM drive with a DVD-ROM drive, upgraded the memory to 512MB of SDRAM, and installed a USB card to add 4 more USB ports to the PC. Third, I formatted the ol' hard drive and loaded all new software on the PC. And, what would a fresh software install be without a new ROM set, so I contacted a burner via the Lazarus Project and got myself a brand new complete ROM set for the 0.87 version of MAME, on 7 DVD-Rs! I also installed the ZSNES emulator so I could play my favorite SNES games on the MAME cabinet. Since the SlikStik isn't ideal for SNES controls, I picked up the Saitek P880 Dual Analog Game Padto use for the SNES games. July 12, 2003 - Well, it's been almost 2 months since I last worked on the cabinet. I blame that on the cabinet being 100% operational. Since it was working, in my mind it was done. Well, today I spent about 90 minutes putting the finishing touch on the cabinet, which involved mounting the cabinet door on the front of the cabinet. I used two normal hinges to mount the door, and I put a magnet on the door and a metal plate on the cabinet so that the door would stay closed. I also mounted a handle on the door so that it could be opened easily. And, that's about it. I am considering putting a lock on the door so that nobody can mess around inside the cabinet (we host a lot of family parties with a bunch of little kids), but I haven't made up my mind yet. If I do decided to do it, the work would be trivial. So, I think I can say today that the cabinet is done!!! May 6, 2003 - I finished working on and installed the bezel today. Over the last couple of days, I have put 3 coats of black paint on the bezel. The bezel didn't hug the TV like I had hoped, so I put some weather stripping around the edges of the holes that I cut in the bezel for the TV screen and the remote control sensor / power button access. The weather stripping added the necessary depth so that the bezel now touches the TV on all sides. Looks pretty good...especially since this is the one piece of the cabinet I really didn't think about until I had to do it. Now all that is left is the coin door (or front access door since I am not installing a coin bank). The next entry will most likely be the last entry!!! April 29, 2003 - I started working on the bezel today. For the bezel, I decided to go with 1/8" thick hard board. One of the main reasons I went with the hardboard is because it is flexible enough to bend around the curved front of the TV. I decided against glass because I thought it would be too much of a pain. Also, LuSiD's cabinet doesn't have any glass, and it looks fine to me. I might change my mind and put some glass in later...who knows. So, I first decided how far back I wanted the TV to sit. I installed a piece of wood on the monitor shelf so the TV wouldn't slide back any further than it is supposed to. I then installed 2 more pieces of wood on the bottom of the speaker panel for the bezel to rest against. I then used a jig saw to cut a hole in the bezel for the TV screen to show through. To do this, I had to start out by cutting a hole in the center of the hardboard, where I knew the TV screen would be. I then had to put it in place, and determine how much more I needed to cut to show the entire TV screen, and nothing but the TV screen. I had to repeat this several times until I had a hole that was the right size and shape, and in the right spot. I also cut a hole so that the TV power button and remote control sensor show. I also had time to prime the bezel today. I will paint it black like the rest of the cabinet in the next couple of days. April 24, 2003 - The SlikStik came today!!! Yippee!!! As soon as I got it, I mounted it right onto the cabinet, plugged it in, and started playing. It took me a whole 5 minutes to set it up, and that time includes the time I spent unwrapping it. Since MAME is already pre-configured to work with the SlikStik, almost none of the games need additional configuration. Hell yea!!! I also spent a little bit of time yesterday cleaning up all of the wiring inside of the cabinet. I used some mounting cable ties to bundle all of the cords together and mount them to the cabinet. So, now it doesn't look like a bird's nest inside the cabinet. Now all I have left to do is mount the coin door and put up some sort of a bezel. April 22, 2003 - I did quite a bit of work today. First off, the duct tape I put around the speakers wasn't blocking out all of the light. So, I bought a black hand towel from Target, cut it up into strips, and used the strips to fill in the the parts of the speaker hole that the speaker didn't cover. I secured the towel strips to the cabinet with a staple gun, and I taped the other part of the towel strip to the speaker. So now, no light is getting through. Today I also set up the MAME computer in the cabinet. It was already configured and ready to go, so hooking it up took no time at all. After that, I ran out to Best Buy and picked up a JVC 27" TV (Model #AV27320). I picked this one because the picture looked good, it had an S-Video out jack, and it also had Component Video jacks. I am using the S-Video jack on my video card to display the picture on the TV. Also, I figured that if I ever wanted to use this TV for anything else, the Component Video jacks would be nice to have. Since I had both the TV and the computer down here, I decided to hook everything up (including a makeshift control panel with a keyboard and a mouse) and play a couple of games. Just playing the games in the cabinet rocks. The TV is huge, and the sound is awesome. I can't wait until my SlikStik comes. Speaking of the SlikStik, I received the shipping confirmation on my SlikStik today! Needless to say, I will be tracking this sucker all of the way to my front porch. April 17, 2003 - Put the marquee up today. WooHoo! The thing looks frickin' awesome. However, I did have to do some extra work to get it to look right. First off, the marquee was just a tad too small, so it didn't cover the entire opening, which was letting some light shine through on the sides. So, I took some extra wood, cut them to fit in the marquee area, covered them with black duct tape, and used my new hot glue gun to glue them to the inside of the cabinet. Now, when the marquee is in place, very little light comes out the sides. Cutting the plexiglass was a pain. I screwed up 3 pieces to the point where they were unusable. And of the two that are usable, one is cracked (that one is in the back), and one is misshaped. Luckily, the marquee retainer I bought from Happ Controls covers up the misshaped front plexiglass. Some people say that a marquee retainer isn't necessary, but it sure does make things a hell of a lot easier. So, to put it up, I simply sandwiched the marquee between the two pieces of plexiglass, which is all held in place by the marquee retainer. I also installed a surge protector in the cabinet today. I put it in a place that is going to be easily accessible after the coin door is put on. I'll simply have to open up the coin door, reach inside to flip the switch, close the door, and play. April 15, 2003 - Today was a very productive day. I installed the speaker grills, the speakers, the t-moulding, and I moved the cabinet out of the garage into the house (with the help of a friend...the thing weighs a frickin ton!). On the top left side of the cabinet I goofed a bit while cutting the groove for the t-moulding. The groove was too large for the t-moulding to fit securely in it. So, I went to Home Depot, picked up a hot glue gun, and used the hot glue to hold the t-moulding in place. This seemed to do the trick. I installed the speakers using the latest fastening technology...rubber bands and duct tape. I screwed in two hooks on each side of the speakers, and I stretched some rubber bands over the speakers to the opposite hook to hold the speaker in place. I then used duct tape to seal off the speaker hole to prevent light from the marquee from shining through the parts of the speaker hole that the speaker didn't fill. This seemed to work pretty well also. For speakers, I am using the Creative Labs 2500 2.1 speaker system. The subwoofer makes all the difference in the world! April 11, 2003 - Applied the 3rd and final coat of black paint to the cabinet. April 5, 2003 - Threw the 2nd coat of black paint on the cabinet today. One more coat to go. April 2, 2003 - Today I applied the first coat of black semi-gloss paint. HELL YEAH! I'm on the home stretch and can see the finish line! March 30, 2003 - Today I used a can of spray texture that I picked up at Home Depot to add some texture to the cabinet...just like the real cabinets have. I was going to start painting today, but I wanted to give the texture adequate time to dry. So, the first coat of black paint will be going on next time. If you use this spray texture, keep this in mind. THIS CRAP GOES EVERYWHERE!!! So, make sure you cover up the stuff you don't want to be textured. I managed to hit several things in my garage with this stuff. Thankfully, nothing too important was hit, because this stuff is a pain to get off. March 29, 2003 - Today I sanded down the wood filler patches, and I primed the cabinet. I used two coats of primer because one coat didn't seem to do the job. Better safe than sorry. March 28, 2003 - Today I patched up all of the counter sunk holes with some wood filler. I also moved the marquee light fixture back further to make room for the speakers. By doing this, I had to take it off of its hinges...so I can no longer get behind the light fixture. This shouldn't be a problem because I shouldn't need to get behind the light fixture for anything. There will be nothing behind the light fixture. I also inverted the light fixture so the light bulb is at the top now. This will prevent the speakers from casting a shadow on the marquee. March 24, 2003 - I placed the order for my SlikStik today. I was planning on building my own controls until a co-worker told me about the SlikStik. I was very impressed with what I saw, and I have yet to read a negative review about these controls. I don't have too much experience with soldering, and from what I was planning on spending, the SlikStik was only about $50 more! So, how can I go wrong? I ordered the SlikStik classic, with some minor customizations. It should arrive in about a month, which is when I plan on having the cabinet finished. March 23, 2003 - Today I cut the holes for the speakers and installed the monitor shelf. To cut the holes for the speakers, I used my RotoZip with the circle cutter attachment. This worked very well. For the monitor shelf, I used a couple of spare pieces of wood to hold the shelf up, and then I further secured the shelf with 2 2x2's underneath it. I can sit on the shelf without any trouble (I weigh about 190 lbs), so it should have no problem holding an 80 lb TV. The main part of construction is now complete. Next up I have to fill the holes with wood filler, and then prime and paint the cabinet. March 19, 2003 - Received my orders from both Happ Controls and EMDKAY.net. Talk about quick service! March 16, 2003 - Today I placed an order with Happ Controls for the t-moulding, a marquee retainer, and a pair of 4" speaker grills. I also ordered a marquee from EMDKAY.net (I got the Nebula Mame Marquee). March 15, 2003 - Today I installed the light fixture for the marquee and the speaker panel. I picked up the 24" single bulb plug-in light fixture at Home Depot. I put the light fixture on hinges so I could tilt it back if I would ever need to get behind it. This turned out really nice. I also installed a sliding lock to hold the light fixture in place (either in its regular position or tilted back). The speaker panel went on nice and easy. I still need to make holes for the speakers, but I am waiting until I find some speaker grills that I am happy with. February 27, 2003 - I worked on the cabinet for about 3 hours today. In that amount of time I was able to get the side panels, top, and back of the cabinet in place. Now it is starting to look like an arcade cabinet! I started out by putting a bunch of L-Brackets in place to hold all of the pieces together. After I had it assembled, I went around with my countersink drill bit and drilled a bunch of pilot holes for some 2" screws to hold the cabinet together a little better. Now it is pretty stable. I still need to install the speaker panel, the monitor shelf, and the front door, but that will have to wait until next time. February 16, 2003 - Worked on the cabinet for about 20 minutes today. The base of the cabinet is now fully assembled. Next up are the sides and back of the cabinet. February 15, 2003 - This was my first real work day on this project. I took an early morning trip to Home Depot to pick up some construction supplies (screws, L-Brackets, etc). I had already purchased 3 4x8 sheets of 3/4" MDF and Home Depot was nice enough to make several cuts for me. So today, I had to make the rest of the cuts that Home Depot couldn't make. I also routed out all of the groves for the t-moulding. For this, I used a 1/16" slot cutting router bit that I picked up from Woodbits.com (Part #WL-1330). The router sits on top of the wood, and the router bit hangs down and cuts into the side of the wood...for a nice even, straight cut. So, as of right now, all of the individual pieces are cut out and all ready to be assembled. MAME - The Multiple Arcade Machine Emulator home page. LuSiD's Arcade Flashback - My main source of inspiration. James' Mame Machine - Another source of inspiration. Build Your Own Arcade Controls - This site is the mother site for arcade cabinet building. If you have a question about cabinet building, odds are you can find the answer here. EMDKAY.net - The makers of my marquee. I am really happy with this marquee, and I think it was less expensive for me to order one than for me to do it myself (considering most people were spending over $30 to have Kinkos print out their design). Not to mention that I have absolutely no artistic abilities. Happ Controls - Sells everything related to arcade machines. Monitors, track balls, spinners, replacement parts, etc. I can't imagine building a cabinet without purchasing at least one item from Happ Controls. Woodbits.com - Where I bought my router bit to cut the groove for the t-moulding. Please feel free to e-mail me if you have any questions or comments about anything on this web site. © 2019 John P. Wood. All Rights Reserved.